For Christmas Eve, also known as Zombie Yule Eve by certain people (you know who you are), I give you the very last bonus zombie from my Cthulhu Coloring Book. Starting next week, you’ll be spammed with images from my new coloring book, instead! This style is called “chibi” or “super deformed” Japanese manga and anime artists — the giant head and body that’s 1-2 heads high, that is, not the crazy-eyed zombie part. It’s one of the styles I offer when Cartoonifying people, so I decided to do a zombie example, because really, who hasn’t wanted to be a cartoon zombie? I’ve had a lot of fun coloring my various zombies, too. She’s done in a very soft blue with shading in grey, where the severed head she’s keeping for a snack later is done in a pale pale flesh tone with shadows in two shades of blue. Her lips are a nice blue, as well, and her sharp, sharp teeth have just a hint of blood on them. 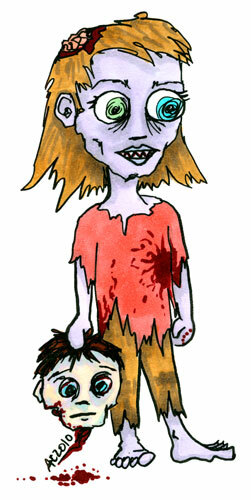 Chibi Zombie Girl, 5″x7″ pen and ink and Copic markers on watercolor paper.